The idea for a mural came after a 2009 fundraiser to help Gutierrez pay her medical bills. “When we found out she was sick, we knew we had to do something,” said Gonzalez, who was commissioned by Medina in 2009 to create a flyer for the fundraiser to support the DJ in her health struggle. The original flyer featured an image of Gutierrez surrounded by Rumba drummers with the Golden Gate Bridge as a backdrop. 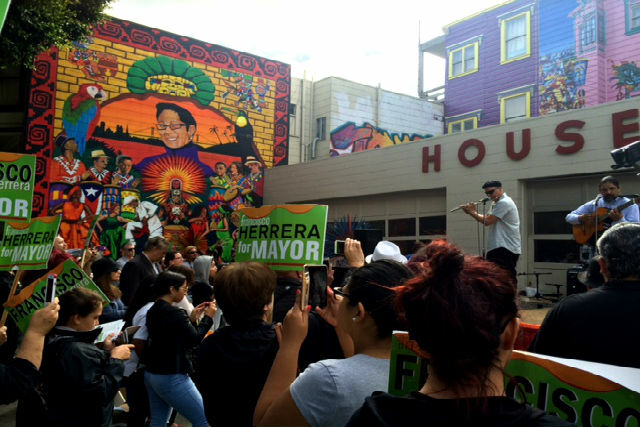 After promising to plug her business (Gonzalez incorporated Ramos’ logo into the Chata Mural), Ramos gave him permission to place his mural on the side of her building. However, the muralist still lacked the necessary funding to go forward. It wasn’t until the winter of 2014 that the timing was finally right. 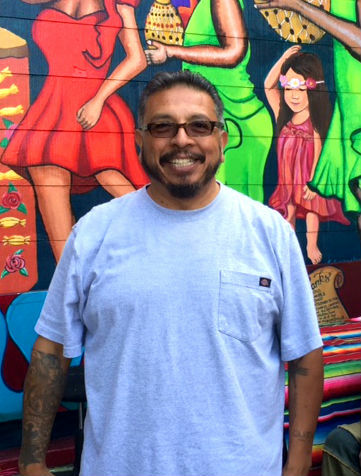 Gonzalez was approached by Susan Cervantes of the Precita Eyes Muralists Association with a grant from the city commissioning four murals. After retiring from his job as a probation officer in May, Gonzalez was able to focus full-time on the mural, which took just three months to paint. “The kids tweaked the original design and really enhanced it — they made it more beautiful than it was before,” he said. Although the mural was completed in early September, the unveiling ceremony was set for October 10 to coincide with a rally in support of Prop. I, the November ballot measure proposing a moratorium on new developments in the Mission District. “Chata was very much about the preservation of our culture and promotion of our people and in the end, that’s what neighborhoods are about. This is a very critical election for San Francisco — with proposition I on the ballot among others, we are trying to preserve who we are as a city,” said District 9 Supervisor David Campos.